After only a couple of hours with the public on Sunday, August 26th in Sackett’s Harbor, NY, the crew of the Lois McClure enjoyed a few days off in the small but lovely historic town of Sackett’s Harbor. 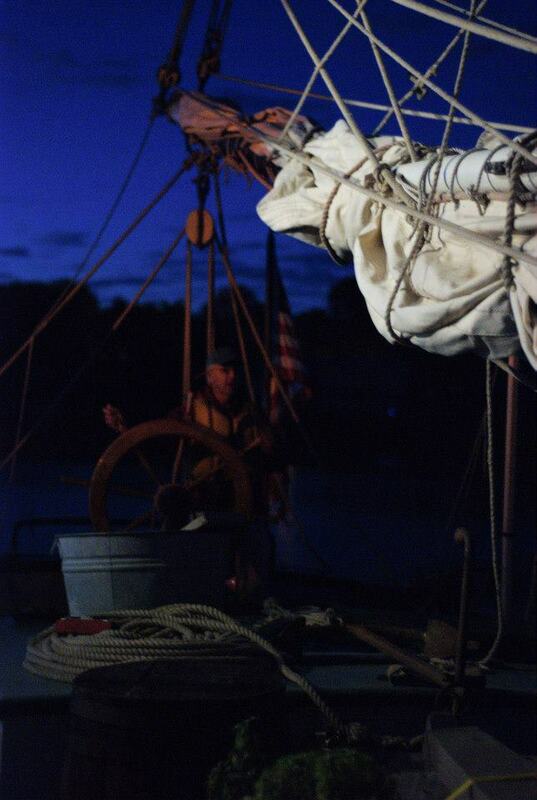 The Captain and First Mate had decided that our best weather day for passage on Lake Ontario would probably be in the middle of the week, so on Wednesday, August 29th, the entire crew woke up at 4am to prepare for departure at 5am, well before sunrise. Departure went smoothly, or at least it seemed that way, being the rookie sailor I am. Lucky for us our Oocher crew, Ian and Kerry, was able to collect a line we had to leave behind or lose Len overboard, but other than that we left Sackett’s Harbor in one piece. In the dark we entered the vast expanse of water that is Lake Ontario. While the majority of the crew stayed aboard the Lois, Captain Roger and Art towed from Churchill, and so Tom and Kerry were left in charge of steering and general ordering around of the rest of us. 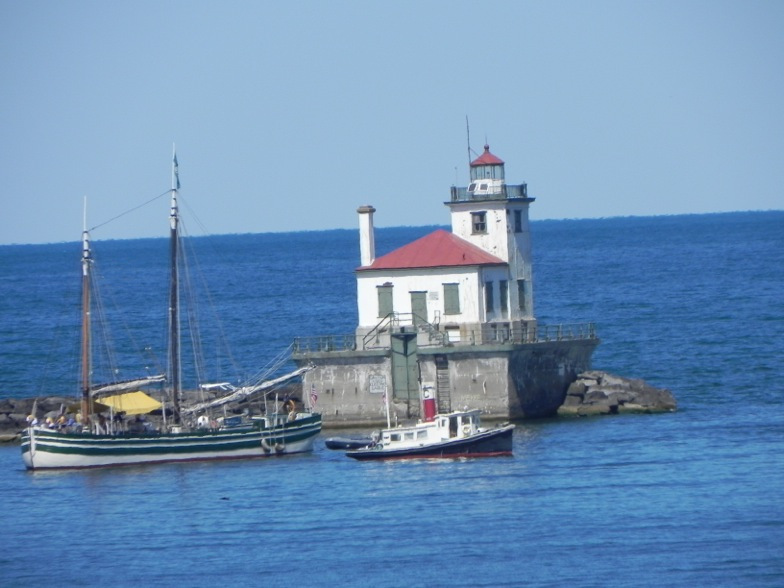 Being brand new to the whole moving a canal boat experience, the seven and a half hour passage across Lake Ontario from Sackett’s Harbor to Oswego was certainly an exciting start. Lake Ontario was historically only rarely used by canal schooners due to the dangerous swells and potential for terrible weather. Our modern forecasting equipment, and our Captain’s good judgement allowed us to choose a very calm day to make the journey, and thankfully so. Even with wind well under 5mph, we were still rolling to swells that had been created by winds earlier in the week. It was rather unpleasant to be stuck below decks for any length of time. No wonder canal boaters disliked crossing wide expanses of water! These boats were certainly not made for it, though Lois held her own. We saw a large number of fishing boats early in the morning, the crews of which were certainly shocked to see us carving a nice line between them. I liked to imagine them as huge pirate ships that we’d have to fight our way through. Only some of the crew entertained my ideas for any lengths of time. While passing through these fishing boats we watched the sun rise behind us, a fantastic sight on the water. After the sun came up the crew settled down for the long trip, enjoying a second breakfast around 9am and munching on cookies all morning long. I entertained myself (and the crew) by walking forty-two laps around the deck to equal a one-mile walk, while enjoying the illusion of the lake falling off the end of the earth to the West. 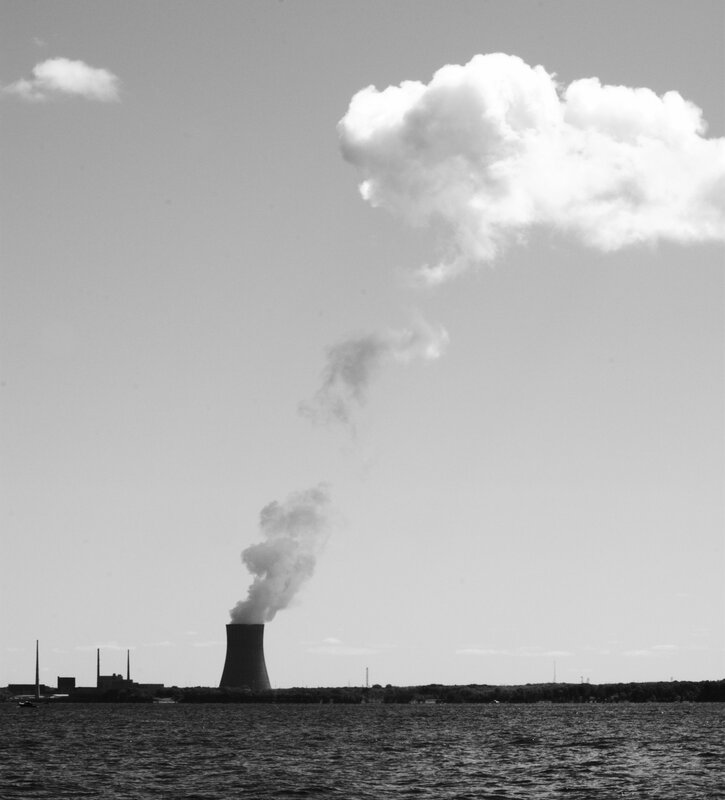 We saw the tower of Oswego’s nuclear power plant from early on in the trip, probably some twenty miles out still, and watched as it slowly got large enough to see clearly. Finally we approached the breakwater of the Port of Oswego, sometime around noon. Some excitement occurred as Art pulled in the tow line onto the tug and we were approached by a motorboat offering assistance. Only once we were well inside the breakwater did the swells no longer roll the boat. Here Churchill assumed her regular place at the hip of Lois, guiding her into the pier next to the H.Lee White Maritime Museum, where we were welcomed by Mercedes Niess who was our main host here. A recent graduate of Concordia University in Montreal where she studied archaeology, Carolyn was introduced to the Lois McClure project while doing a nautical archaeology field school at LCMM.